A newly launched contest is asking the public to choose a name for the closest known exoplanet to our own solar system. The space-funding company Uwingu announced Tuesday (March 19) that it is seeking a more exciting name for the Earth-size Alpha Centauri Bb, a rocky but scorching-hot alien planet that lies just 4.3 light-years away. "Alpha Centauri Bb is a fine designation for us astronomers, but let's face it — it's a little boring," Uwingu CEO Alan Stern, a former NASA science chief who also heads the agency's New Horizons mission to Pluto, said in a statement. "Let’s see what the people of planet Earth would want to name their nearest planetary cousin." "This is a new way for the people of Earth, of every age, of every nation, of every walk of life to personally connect to space discoveries, and to help fund space research and education in the process," Stern said. The person who proposes the winning name will receive a commemorative plaque, a free 12-month subscription to Astronomy Magazine, a shout-out on the Uwingu website and a phone call from Stern and famed exoplanet hunter Geoff Marcy of the University of California, Berkeley, who is an Uwingu adviser. Prizes will also be given to people who submit names that receive 100, 1,000 and 10,000 votes, Uwingu officials said. To participate or learn more about the contest, which runs through April 15, visit www.uwingu.com. The new contest is an extension of Uwingu's "Baby Planet Name Book," a project the company launched last fall to solicit names for the thousands of exoplanets and exoplanet candidates being discovered around the Milky Way galaxy. Uwingu officials stress that any monikers the public offers up — even the one that wins the Alpha Centauri Bb contest — will not be official. The International Astronomical Union is the only body authorized to name celestial bodies, and so far the IAU has expressed no desire to change the planet-naming status quo, in which alien worlds take the name of their parent star along with a lowercase letter. The first exoplanet discovered in a particular system is designated "b" (since the star is implicitly "a"), the second "c" and so on. Since detecting the first alien planet around a sun-like star in 1995, astronomers have discovered more than 800 such worlds, with nearly 3,000 more candidates awaiting confirmation by follow-up observations. The discovery of Alpha Centauri Bb was announced last October. 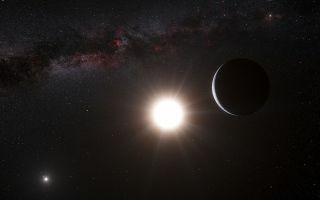 The planet, which astronomers say is far too hot to host life as we know it, resides in the three-star Alpha Centauri system, the nearest system to our own sun. For more information on the planet-naming contest, visit Uwingu's website here.